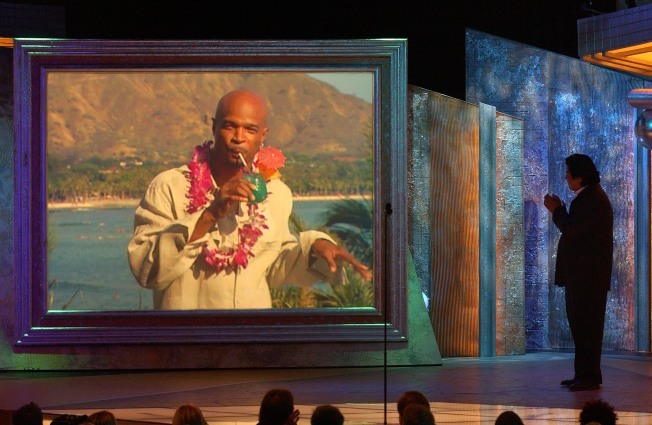 Actor Damon Wayons (L) gives a pre-recorded acceptance speech after receiving an award for comedy series (My Wife and Kids) by actor George Lopez at the 4th Annual Family Television Awards. Damon Wayans will be at Cobb's Comedy Club tonight. He is the creator, executive producer and star of "The Underground" and is known throughout the world for his unique comedic style. Wayans has been in several movies and has also starred on the ABC series "My Wife and Kids," which he co-created and executive produced. The show starts at 8 p.m. at Cobb's, 915 Columbus Ave., in San Francisco. If you are into a more phyiscal comedy show why not check out the Steel Cage Comedy Night with Kris Tinkle and a special interview with UFC Fighter Mike "Quick" Swick. Kris Tinkle, the Steel Cage Comedian, will take the stage at 8 p.m. at the San Jose Improv, 1113 2nd Street, in San Jose. The show will feature a series of comics and an on stage interview with the fighter. Pop singer Matthew Sweet performs some of his more well known pop songs such as "Girlfriend," "Sick of Myself" and "Where You Get Love." The show will start at 8 p.m. at the Great American Music Hall at 859 O'Farrell St. in San Francisco.